Wheat: Is It Really 2007/08 All Over Again? After a torrid week, now that the phones are silent I thought I'd sit down and try and make some sense of the wheat market, to attempt to analyse just how bad things are and if the recent surge in prices is really justified. Let's start by having a look at the good old fashioned supply and demand perspective. 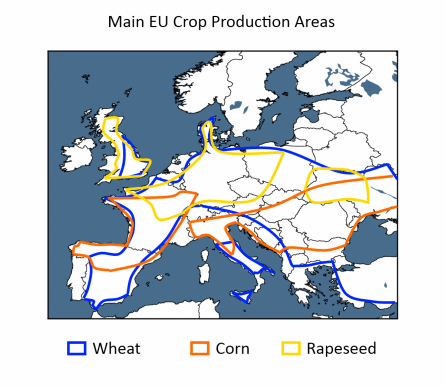 The USDA currently have global wheat production in 2010/11 at 661 MMT, that includes 53 MMT from Russia, 14 MMT from Kazakhstan, 20 MMT from Ukraine and 141.8 MMT from the EU-27. It seems pretty clear that all of those numbers are too high, collectively around 19 MMT too high by my estimates in the table lower down on the right. Knocking 19 MMT off the USDA's world production estimate gives us a probably more accurate figure of 642 MMT. (Much of the reason for the difference between that number and the total I have is down to China. At this stage that discrepancy doesn't matter too much, unless we were to see China suddenly emerge as a large importer of wheat). The USDA say that the world will consume a record 667 MMT of wheat this year, with prices having risen so sharply that is probably also overestimated but let's run with it for now. By the wonders of my mathematical brain, that tells me we are going to be 25 MMT wheat deficient in 2010/11, which equates to around fourteen days worth of consumption. Effectively that puts us all on a fortnight's wheat-free diet. If we don't want to go on this diet then we're going to have to eat into last season's reserves. According to the USDA there was 193 MMT of those at the end of 2009/10, or 105 days worth of consumption. Hurrah, bacon sarnies all round. We CAN still manage to munch our way through 2010/11 without needing to give up bread for a fortnight AND still have more than 90 days worth of stocks to fall back on. Although of course where those stocks are is pretty important, I mean we can actually get at them can't we? Well, our mates the Indians held about 16 MMT of them, and I think I'd rather take the fortnights diet option than attempt to munch my way through what they've got in store. Our other chums of truth economy the Chinese were supposed to have 56 MMT in reserve at the end of last year. If they really did have is immaterial at the moment, as we know that it's pretty likely that whatever they've got they aren't going to be wanting to sell it to us are they? Egypt were sitting on a further 5 MMT, and they're most certainly not going to be selling that. Not with a huge question mark now hanging over whether the Russians are going to ship any of their existing commitments when the export ban comes in a week from now. The truth then seems to be that of this 193 MMT some 76 MMT isn't going to be coming onto the market any time soon, whittling "rest of the world" 2009/10 reserves down to around 117 MMT. Us lot will account for 463 MMT, or around 70%, of world consumption this year. We had 116 MMT (difference due to rounding) of the world stocks at the end of 2009/10, or enough to keep us going for 91 days. We're going to produce 459 MMT, according to the USDA, but remember that this figure is probably overstated by 19 MMT re Russia, Kazakhstan, Ukraine and Europe. Factoring the 19 MMT overstate in means we're going to eat 23 MMT more wheat than we produce this season, which would drop our reserves below 100 MMT - 76 days worth of supply. And that's without the current market price rationing demand. In the last big price spike of 2007/08 that figure fell to only 45 days. In the "awash" and "glut" days of 2009/10 the rest of the world was sat on 94 days worth of wheat, we're still significantly closer to that than we are to 2007/08. Whilst there is certainly some justification in the recent price rally, the fundamentals of supply and demand don't really warrant one of this magnitude. 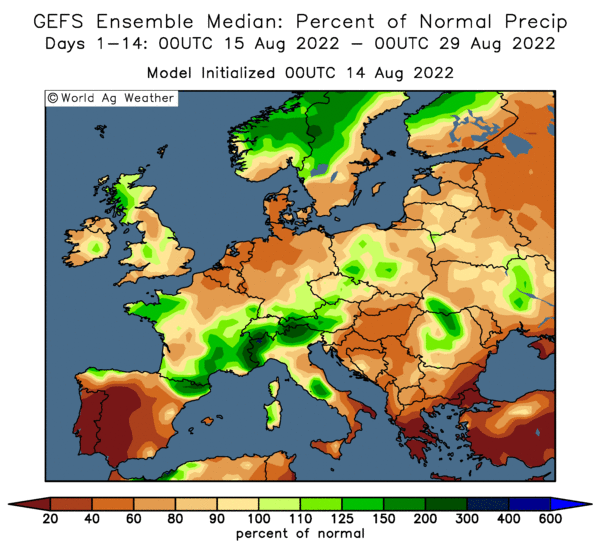 Although there are legitimate concerns over winter wheat planting prospects in Russia this year, European and US farmers will be only too keen to embrace the current price levels with significantly higher sowings. That is exactly what they did for the 2008 harvest which saw EU output up by 26% and US production up by 22%. Despite London, CBOT and Paris wheat all closing higher on the week, all three actually closed nearer the bottom of the week's trading range than the top. Is the top already in? That as ever is a difficult one to call, and the funds are certainly likely to have another attempt at sending it higher again. 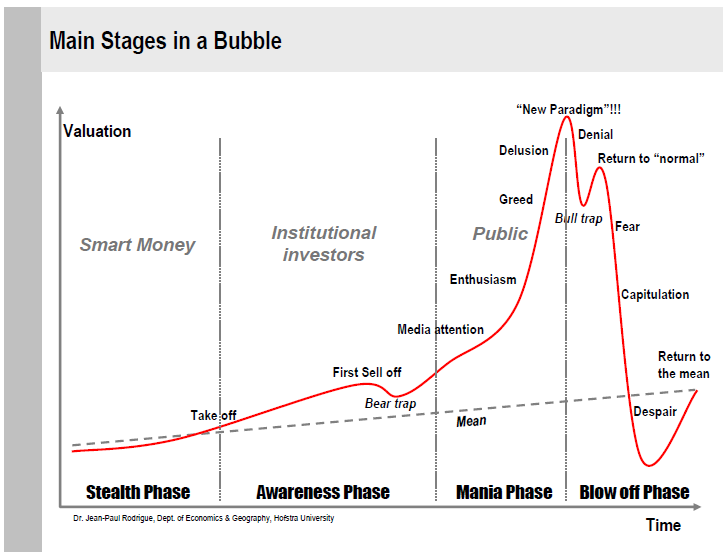 I'm tempted though to say yes, so beware of the "bull trap". Somebody paid GBP169 for November London wheat last week, I guess that could easily fall into the "delusion" category. There's now 6.4 MMT worth of open interest in November Paris wheat. I think I'd rather be first out than last out if I was sitting on that. Footnote: I treated myself to an afternoon in the pub Friday, the taxi driver and at least three other people I met with no involvement whatsoever in the grain trade all wanted to talk to me about wheat. That probably tells you all you need to know. Another week of extreme volatilty in the grain markets saw Chicago wheat close almost 10% higher on the week, yet astonishingly also 13.7% down on the week's high of USD8.41/bushel. August soybeans closed at USD10.559, up 4 cents; August soybean meal closed at USD313.60, unchanged; August soybean oil closed at 41.39, up 13 points. Beans would probably closed higher but for spillover weakness from limit down wheat. The USDA announced another purchase of 336,000 MT of soybeans fby China, bringing this week’s total announcements to 1,251,000 MT for 2010/11 delivery. Exports for 2009/10 have already exceed 2008/09 by 3,699,200 MT. September corn closed at USD4.03 1/4, up 3 1/4 cents; December corn closed at USD4.18, up 3 cents. Corn benefited from the notion that the recent price rise in wheat will spur increased demand for corn. Analysts are already starting to look ahead to next Thursday's supply and demand report from the USDA. FC Stone and Informa both peg the corn crop at 13.4 billion bushels, compared to the USDA’s July estimate of 13.245 billion. Wheat futures fell by the 60 cent limit today on all three exchanges but were still up 64, 46 and 35 cents for the week on the CBOT, KCBT and MGEX respectively. Russia's deputy prime minister said that the ban on exports would be reviewed after the harvest is complete, sooner than the Dec 31st deadline set earlier in the week. Pre-weekend profit taking was also a factor, funds sold an estimated 15,000 CBOT contracts on the day. Another volatile trading session saw November London wheat close GBP6/tonne lower at GBP152.00/tonne, with November Paris wheat ending down EUR14/tonne at EUR209.50/tonne. Whether the market has topped or if this was just pre-weekend profit-taking remains to be seen. End users are left short and caught by the suddenness and magnitude of the recent rally. Whilst some will certainly be scaling back on their usage, that isn't an option for everyone. The Russian ban on exports comes into place in next weekend, and although some reports suggest that around a million tonnes of grain will be exported between now and then, others say that force majuere is already being claimed by some exporters. Meanwhile, although Ukraine is officially saying that it hasn't put export restrictions in place (and to comply with WTO rules they can't), unofficially it would seem that sufficient volumes of red tape have been put in place to effectively block grain from leaving the country. That's two of the world's cheapest sellers shutting up shop, and there are reports that a third, Kazakhstan, is being "encouraged" by Russia to do likewise. At home all the grain merchants I am talking to are reporting getting wheat offered to them at a phenomenal pace. The problem that they have is hedging it effectively and efficiently with margin calls becoming "crippling". Open interest in November Paris wheat continues to run well in excess of 6 MMT, reputedly more than six time the grain storage capacity in the whole of Rouen. If the longs decided that they actually wanted to take delivery of their contracts, there isn't in fact sufficient authorised futures storage capacity in the port to make anything like that volume available! This is the second morning on the trot that I've switched the screen on and gone to www.grainportal.com and thought that it isn't working properly. It's showing last night's closes on wheat under the eCBOT tab surely isn't it? There must be some kind of techie mistake, but no wheat really is another 40 odd cents up again this morning. Yikes. Reports circulating this morning now suggest that Russia is to "ask" neighbours Kazakhstan and Belarus to also suspend exports. Russia's state-run United Grain Company has also said that it is "tightening security" around what grain it does have in store. August soybeans closed at USD10.55, up 2 cents; August soybean meal closed at USD313.60, up USD2.10; August soybean oil closed at 41.26, down 10 points. Weekly export sales were a combined 1,174,088 MT, expectations were for sales of 950,000 – 1,250,000 MT. Actual exports were 259,700 MT. In addition the USDA reported 455,000 MT of new crop soybeans for delivery to China and 111,500 MT of new crop soybeans for delivery to unknown. September corn closed at USD4.03 1/4, up 3 1/4 cents; December corn closed at USD4.18, up 3 cents. Weekly export sales were a combined 1,294,058 MT, above the high end of trade estimates for combined sales of 900,000 to 1,200,000 MT. Informa analyst’s forecast US corn production at 13.448 billion bushels with a yield of 166 bu/acre. Sept CBOT wheat closed at USD7.25 3/4, up 45 3/4 cents; Sept KCBT wheat closed at USD7.26 1/2, up 41 1/2 cents; Sept MGEX wheat closed at USD7.32, up 35 cents. Weekly USDA net export sales 854,600 MT for the 2010/11 marketing year were slightly above expectations for sales of 600,000 to 850,000 MT. Interestingly Egypt featured as a 110,000 MT buyer. Exports came in at 572,700 MT. Blimey what a day (again)! Nov London wheat closed GBP6.50/tonne higher, having been an unprecedented GBP17.50/tonne higher at one stage. Nov Paris wheat ended EUR14.50 higher at the close. Yet again the market was on fire, Russia apparently finally imposed an export ban on all grains from Aug 15th through to the end of 2010. The market is "going mental" as growers fall over themselves to take advantage of the current market prices that they could never have even dreamed for just a couple of months ago. That in itself brings quite a few problems for merchants, with "crippling margin calls" making business difficult for many to say the least. It continues to be a very difficult market, despite soaring world prices few "normal" players seem to be on the right side of this latest rally. 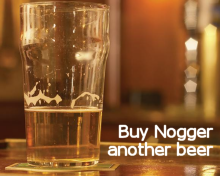 A leading UK grain merchant is refusing to buy any more grain at current levels as the only way of hedging purchases is by selling futures and the margin calls are now crippling, is one story reaching my ears today. Faced with a dearth of real physical buyers willing to pay these prices they're caught between a rock and a hard place. Sell the futures and carry the physicals hoping that the market doesn't collapse before a buyer can be found? Not a lot of prudence there is there? Meanwhile the physical longs that they have to offset the futures shorts will be shrinking all the time as ex farm tonnage evaporates, as it has the habit of doing when prices rise by more than fifty pounds a tonne. Who'd want to be a grain merchant in this market? Additionally, the wheat going into the bioethanol refineries is going to be dearer than the DDGS coming out before long if this carries on. Meanwhile the price of crude has hardly moved. We must be getting near to delusion now. The overnights closed sharply higher, led by limit up wheat. European markets are also through the roof as Russia announce an Aug 15th-Dec 31st ban on grain exports. The USDA's weekly export sales reports were at or just above the upper end of trade estimates for wheat, corn and beans. Add to that Egypt also featured as a wheat buyer taking 110,000 MT, and China bought both old and new crop corn and large quantities of new crop beans. My haven't they been busy! 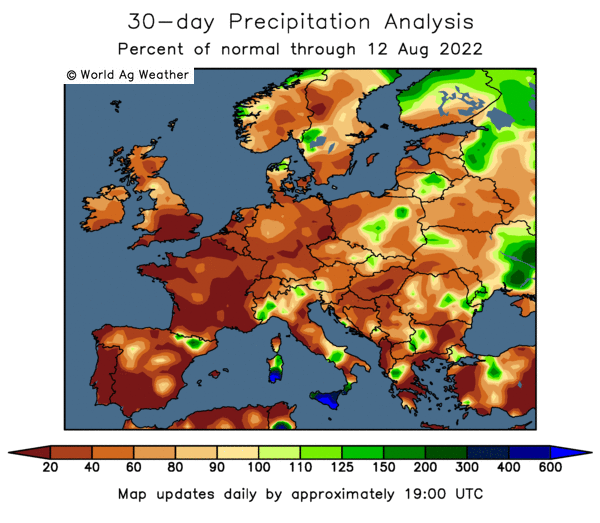 Meanwhile Martell Crop Projections say that "a heat dome entrenched in the South Central United States is expanding its influence northward into key corn and soybean growing areas". That might add to the nerves this afternoon. Wheat is called limit up with beans and corn around 15-20 cents higher. If wheat can hold limit up then expect corn and beans to go higher than the opening calls too. There is already talk of Asian buyers switching into corn as wheat prices soar. Net sales 854,600 MT for the 2010/11 marketing year were slightly above expectations for sales of 600,000 to 850,000 MT. Interestingly Egypt featured as a 110,000 MT buyer. Exports came in at 572,700 MT. Net sales were just 6,000 MT for delivery in 2009/10 as traders switch their books around as the end of the marketing year approaches. Old crop featured decreases for China of 172,400 MT. Those seem to be switches into new crop where the USDA reported net sales of 1,168,100 MT, including China (799,500 MT) and unknown destinations (308,000 MT). Expectations were for sales of 950,000 – 1,250,000 MT. Actual exports were 259,700 MT. Net sales of 472,200 MT for delivery in 2009/10 and 821,900 MT for delivery in 2010/11 exceeded expectations for combined sales of 900,000 to 1,200,000 MT. China took one cargo each of old and new crop. Actual shipments were 833,300 MT. Every time I change the upper limit on the charts on Dalmark's excellent http://www.grainportal.com/ I have to increase it even higher again ten minutes later! At least not since the last time we saw something like this. Blimey London wheat up a fifteen quid, Chicago wheat up the 60 cent limit on the overnight market and Paris wheat up 19 euros. Where are all the "burdensome stocks" brigade now then? The danger is that this now leaves the door open for the "the world is going to starve to death, I told you this was coming" loons to come crawling out. Russian PM Putin will support a "temporary" ban on grain exports to take effect from August 15th and last for the remainder of 2010 is the story currently doing the rounds. That shouldn't pose too many problems, Ukraine have plenty of wheat to sell at these prices now that they've just cancelled all their old contracts! Egypt's GASC chairman Nomani Nomani really will be sweating like a gerbil in a gay bar now. He'll suddenly be willing to accept any wheat from anywhere via any mode of transport. I might start a tractor and trailer ferry up from Romania at this rate. Or maybe he'll start buying wheat delivered via freepost on eBay? Judging by London wheat opening GBP5.50/tonne higher for Nov 10, even Nov 11 is getting in on the act now opening up GBP3.10/tonne. Seasoned traders are shaking their heads in disbelief at what their screens are telling them. Ex farm wheat is now into the GBP140's off the combine, with even hitherto friendless barley nudging an unbelievable GBP130 for immediate collection. FEFAC are begging Brussels to release their 5.7 MMT of intervention barley to cool the situation, but the Commission are staying silent for now. Presumably they are so gobsmacked at the profit they are suddenly going to make that they can barely speak. The temptation to let it run up a bit more yet and put a ruck of money back into the empty kitty must be enormous. The fact that Russian wheat is still winning the majority of the high profile tenders around doesn't seem to matter, at least someone is still buying even at these sharply higher prices. Let the Russians have the business for now and we will step in when they are sold out at even higher money. That's the prevailing attitude at the moment. Why sell today when it will be dearer tomorrow? Defaults are suddenly what everyone is talking about, whether it's farmer Giles down the road or entire countries doing the defaulting. Believe it or not (I don't blame you if you don't, I can scarcely believe it myself and I was there) I was up before six this morning to check on the overnight market, at that time eCBOT wheat was around 8c firmer, adding to last night's impressive 45c gains. We are currently around 21c firmer I see, where will it all end I wonder once European traders get to their desks this morning? The bulls certainly seem to have the bit between their teeth. A higher opening in London and Paris again this morning looks like being on the cards despite Russian wheat winning yesterday's Egyptian and Jordanian tenders. One un-named trading house is reported to have switched origins on two cargoes of wheat sold to South Korea from Ukraine to US, citing "supply-related issues". Whether that means they can't physically buy it in Ukraine, or customs won't let them ship it is unclear. There have been reports of customs-related congestion in Ukraine as they prevaricate over the recently introduced testing criteria needed to clear wheat for export. The wheat harvest in Ukraine is already winding down, with the Ministry saying 91% has been cut so far producing 16.67 MMT, implying a final crop of around 18.3 MMT, 12.4% down on last season. Meanwhile a report in Russian newspaper Kommersant says that the government there will not be intervening in the domestic grain markets to cool rising prices by releasing state-owned stocks until the harvest is completed in October. The La Nina weather phenomena continues to deprive Western Australian farmers of some much needed precipitation. The state normally accounts for around 40% of national production and half of all wheat exports. Rainfall since the official start of the growing season April 1 has been less than 40% of normal. Conversely conditions are ideal in the east and potentially record production could come out of NSW and Victoria to at least partially offset losses in WA. However, here we also have the dormant threat of locusts later in the year. That would certainly add more fuel to the bullish fire if that develops into a serious threat later in the Ozzie spring. August soybeans closed at USD10.53, down 1/2 cent; November Soybeans at USD10.24 1/4, up 6 1/4 cents; August soybean meal closed at USDS311.50, up USD3.20; August soybean oil closed at 41.36, up 41 points. FC Stone are also expecting a higher soybean yield guessing 44.0 bu/acre against the USDA last estimate of 42.9 bu/acre. The USDA today reported another new crop soybean sale to China, this time it was for 121,000 MT on top of 223,000 MT sold to the same buyer yesterday. Sept CBOT wheat closed at USD7.25 3/4, up 45 3/4 cents; Sept KCBT wheat closed at USD7.26 1/2, up 41 1/2 cents; Sept MGEX wheat closed at USD7.32, up 35 cents. Estimates for tomorrow’s weekly export sales range from 600,000 to 850,000 MT. Egypt bought 180,000 MT of Russian wheat and Jordan bought 50,000 MT of Black Sea wheat earlier today. November London wheat closed up GBP3.45 at GBP151.50/tonne, with November Paris wheat ending EUR4.75 higher at EUR209.00/tonne. 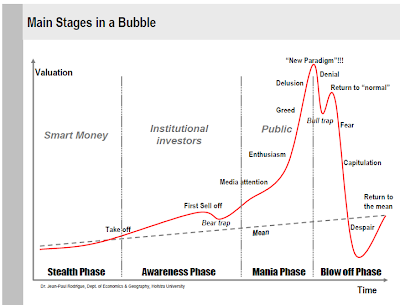 Although the market seems quite clearly to be in "blinkered mental overdrive" even the most resolute of bears appear shell shocked by the size and suddenness of this latest rally. Egypt and Jordan apparently bought Russian wheat miles under the cheapest EU offers, drought or no drought. There are two ways of looking at that. The way that the trade currently seems to prefer is that Russia will soon be sold out and that dearer EU and US wheat will soon get a look in. Open interest in Paris wheat continues to increase, now running at more than 125,000 lots for November, say no more. German wheat yields seem to be running 10-15% below last year, according to the German Farmers' Union DBV. Elsewhere the Food and Agriculture Organization cut its 2010 global wheat production forecast to 651 MMT. The overnight grains closed firmer, led by wheat which posted gains of around 20-26 cents. Beans added around 8-10 cents and corn 5-6 cents. It's the same old, same old, with Russian drought losses and possible export embargoes, or at the very least quotas and all sorts of other red tape hoops to jump through for Black Sea exporters keeping the market very firm. Egypt are back in the market again for wheat with indecent haste, following their last tender only a few days ago. It seems that they will be having to pay at least USD14/tonne more than they did at the weekend, although it looks like Russian wheat is still substantially cheaper than EU or French grain. Defaults, or the threat of them, is another subject rearing it's head as it frequently does when prices move by this sort of magnitude in such a short period of time. That potentially means that some existing business might have to be bought in again, if some prominent exporting nations change the rules halfway through the game. Corn is following wheat higher, despite FC Stone estimating US corn crop to yield 165.8 bushels/acre, more than 2 bu/acre up on the USDA last estimate of 163.5 bu/acre. FC Stone are also expecting a higher soybean yield guessing 44.0 bu/acre against the USDA last estimate of 42.9 bu/acre. The USDA today reported another new crop soybean sale to China, this time it was for 121,000 MT on top of 223,000 MT sold to the same buyer yesterday. Early calls for this afternoon's CBOT session: Wheat up 20-25c; Soybeans up 8-10c; Corn up 4-6c. The German Farmers' Union DBV report that this season's winter barley harvest is virtually complete, with yields nationwide down by 8%. Most of the crop was harvested before the recent arrival of rain, meaning that moisture levels came in at around a nice dry 14%. Bushel weights are highly variable, from 57-74 Kg/hl, but mostly averaging 63-68 kg/hl. Local prices are running at EUR120-140/tonne, they report. The spring barley harvest is only just beginning, and early harvest indications are that yields will be 10-15% down on last year. The winter wheat harvest has really only just begun in many places, with overall yields expected to fall by 10-15% on last season. The arrival of recent rains may lead to further yield losses it is feared, they say. Again highly variable bushel weights are being reported at 66-80 kg/hl. The OSR harvest is also underway, being most advanced in Rhineland on the light soils of Lower Saxony, Westphalia, Saxony-Anhalt and Brandenburg where about three-quarters of the crop has been harvested. Results show an anticipated yield loss of 12% on last season, with oil content generally ranging 40-44%. Producer prices are around EUR320-360/tonne, they say. The corn crop remains well behind normal development due to the June/early July heat and drought, although the recent rains will have improved the situation. Even so below average yields are still expected. First cut silage suffered at the hands of a cold wet spring, with quality and quantity both reduced. Second cut was badly affected by the ensuing heat, they say. Egypt are tendering to buy wheat again for the second time in a week. Dow Jones are reporting that the cheapest Russian grain offered today is USD252, a USD14 increase on the best offer they managed to pick up at the weekend. Although the results of the tender haven't yet been announced, that offer is still significantly cheaper than the lowest-priced French wheat that was offered at the weekend. The market doesn't seem to care if Russian wheat wins again and is behaving almost as if a Russian wheat embargo is a given before too long. Indeed, one employee at Glencore's Moscow office who apparently made unauthorised comments to the media that the Russian government should not only bring in export bans but also allow suppliers to renege on contracts, might be picking up his P45 sooner than he thinks. Or at least finding that he's suddenly being transferred to the Siberia office where there's some important filing awaiting his attention. This season's grain crop could only amount to 65 MMT, he said. That's the lowest estimate yet, but certainly not out of the question, and 10-12 MMT below the level of domestic consumption. The attitude at the moment seems to be "let the Russians have the business, we'll wait for richer pickings elsewhere." That may arrive in the form of Tunisia, who are also in the market for a couple of cargoes of wheat themselves today. A strong case could certainly be made for allowing traditionally cheaper Black Sea sellers to mop up some of these tenders now, with a view that they will either be sold out or have export bans in place by the new year. That could be when some really fruity prices end up getting paid. Even if we know that EU/US/FSU wheat plantings are sharply higher by then, that's not much use if you want wheat in Jan/Jun is it? August soybeans closed at USD10.53 1/4, up 3/4 cent; August soybean meal closed at USD310.90, unchanged; August soybean oil closed at 40.44, up 61 points. Early weakness soon dissipated. The weak dollar is certainly helping US sales hold up. The USDA announced sales of 223,000 MT of soybeans for 2010/11 delivery to China today, in addition to yesterday’s announcement of 116,000 MT to the same location and 130,000 MT to unknown. September corn closed at USD3.90 1/2, down 2 1/4 cents; December corn closed at USD4.04 1/2, also down 2 1/4 cents. Spillover pressure from wheat futures weighed on prices combined with generally favourable crop conditions. USDA weekly crop ratings declined 1% for corn last night. Private analysts’ yield and production estimates will start this week with Informa releasing their numbers on Thursday. CBOT September wheat closed down 13 1/4 cents at USD6.80 a bushel; KCBT September wheat fell 15 1/2 cents to USD6.85; MGE September wheat closed 16 1/4 cents lower at USD6.97. Wheat futures took back some of yesterdays gains although the bulls are still in the driving seat. The USDA reported a sale of 110,000 MT of HRW for delivery to unknown destinations. The USDA report the winter wheat harvest at 83% complete vs. 88% normally. The spring wheat harvest is 5% complete vs. 13% on average. November London wheat closed GBP1.35 lower at GBP148.05/tonne, with November Paris wheat ending down EUR3.50 at EUR204.25/tonne. Both markets opened down before quickly moving sharply lower on profit-taking and a corrective stance from recent sharp gains. By lunchtime however London wheat had clawed it's way back into positive territory, only to give up some of those gains later in the session after US futures opened sharply lower. By the close of play for EU futures, CBOT wheat was also staging it's own comeback from a weak opening on continued concerns for Russian production prospects and the threat of lower exports from the Black Sea region. Open interest in November Paris wheat rose to 128,000 lots, 66% of the entire open interest across all months and the equivalent to 6.4 MMT. In short that is an enormous volume for a position that is, in reality, not actually that far away. Speculative interest is said to be running at record levels now in wheat, both in Europe and Chicago, higher even that the last great price spike of 2007/08. The warning signs are there for all to see. Indeed, winter wheat planting season will soon be upon us, it is inconceivable that growers all across the entire northern hemisphere won't increase sowings significantly with prices at these levels. For now however the bullish trend is intact, despite today's minor setback. Rumours persist of Black Sea sellers at best deferring existing sales due to their surprising inability to purchase sufficient volumes from growers to meet these commitments. Wheat continues to lead the market and the bulls just don't seem willing to let go for the time being. Having traded with double digit losses for most of the overnight session, they managed to claw things back to just 2-3 cents lower by the close. Corn finished around 3 cents weaker, with beans down 7-10 cents. The USDA have reported 110,000 MT of wheat sold to "unknown" today, they also report 223,000 MT of new crop soybeans sold to China. Are things really so bad in Russia that they warrant a 50% price hike in wheat in little more than a month? I suspect not myself. 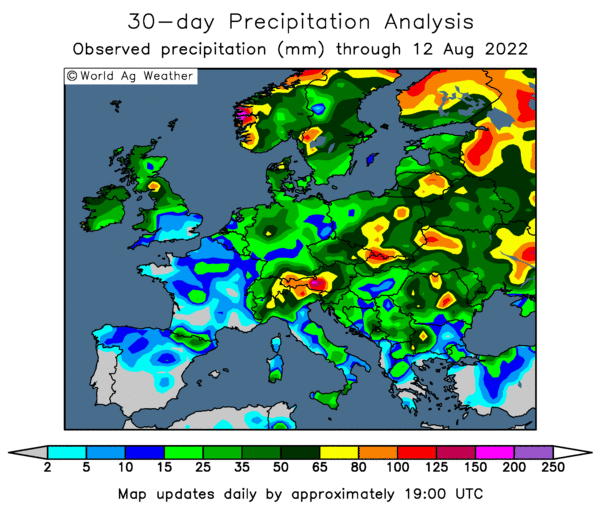 Although certainly there is a legitimate concern that winter wheat plantings there will also now be adversely affected. Some will undoubtedly plant regardless and hope for rain to come to their rescue, others may decide to wait and plant lower yielding varieties in the spring if things don't improve before too long. One thing we can be sure of is that everywhere else all over the northern hemisphere winter wheat plantings will be up this autumn. Probably sharply so. On the demand side, feed mills are already scaling back consumption at these levels. Although things might not be quite so straightforward for the bioethanol refineries, the mathematics of wheat at EUR200/GBP150 and oil at only USD80/barrel might have a few scratching their heads. For now though the bulls seem content to push things higher yet. A mini "Turnaround Tuesday" of modest magnitude is what is being forecast this afternoon with corn and wheat called down 3-4c and beans down 7-8c. Nothing however would surprise me, it seems highly likely that the bulls will want wheat to trade higher so let's see if they can manage to do so. How long is it before some buyers are getting the "you know that cheap cargo of wheat you bought a few months ago, we can't deliver it due to drought/customs, it's totally out of our hands sorry, but do call again" phone call? Resale material offered for the winter ex Liverpool/Avon/Humber at GBP114, try a close bid for a limited volume. Has to be one of the cheapest raw materials around at those levels, and unlike wheatfeed it's available at buyers call. Call/email if you're interested. US officials have apparently pledged USD20 million in aid for Ireland following news of the devastation left behind by Hurricane Higgins. Wheat: Dancing On The Ceiling, Or The Only Way Is Up (Baby)? You know that there's something amiss when the Daily Mirror starts reporting on the price of wheat. In typically Mirror-esque style they warn of "soaring" food prices saying that "this is really scary stuff". Did wheat hit an almost impenetrable ceiling of GBP150/tonne, EUR200/tonne and USD7/bushel all at the same time yesterday? Or are we on our way up to GBP200/tonne, EUR300/tonne and USD10/bushel all over again? This latest spectacular rally certainly isn't demand-led, we all know that. A compounder I saw yesterday told me that their wheat usage was down by around a third at these levels. The question now is surely is how deep are the pockets in those bankers' suits? Yet again it seems that the vulnerable old wheat market has been latched onto as the easiest way to recoup some of last year's losses and restore Tarquin and Peregrine's six and seven figure bonuses, what, what, what. Something surely has to be wrong when the open interest on the November Paris future alone is 123,000 lots? That's over six million tonnes, or around half of the entire French exportable surplus. Yet again it seems that speculative money is holding a hefty chunk of that particular baby. Whilst it is entirely possible that they will be prepared to push things somewhat higher yet, they will not be looking to hold onto November too long. Let's face it they haven't exactly bought it to take delivery have they? "Where d'you want this six million tonnes of wheat tipping guvnor, at the offices in Canary Wharf or those on the Champs Elysees?" They'll be looking to pass November baby onto some other poor unsuspecting sod long before it starts wailing too loudly I'd suspect. The big question is will they attempt to roll it into January, or even March, or just put the little ginger November thing up for adoption and skip town with their ill-gotten mazoolah? That IS a tough one to call. The Russian Ministry have cut their grain crop production estimate to 70-75 MMT, saying that around half of that, 35.5 MMT, has already been harvested. There is now a state of emergency in 27 states. If the drought news wasn't bad enough some news reports are now suggesting that an area of 1.8 million hectares bordering Kazakhstan also has a locust infestation. The Kazakh Ministry have dropped their grain production forecast from "13.5-14.5 MMT" to 13.5 MMT. Harvested area will fall 1 million ha from last season to 15.6 million ha, they add. Ukraine's Deputy PM has said that the recently introduced export restriction on wheat should be removed, suggesting that with carryover from last season they could still export 17 MMT of grains this year. Australia continues to be a "game of two halves" with prospects looking almost ideal in the east but poor in the west. Wheat production in the dry Western Australia state is seen falling to around 6-7 MMT this year from 8.25 MMT in 2009. August soybeans closed at USD10.53 1/4, up 3/4 cent; August soybean meal closed at USD310.90, unchanged; August soybean oil closed at 40.44, up 61 points. Soybean export inspections were below trade expectations at 5.933 million bushels. The USDA confirmed the sale of 116,000 MT of soybeans to China and 130,000 MT to unknown for 2010/11 delivery. Crop condition ratings fell a point from last week in the good to excellent category to 66%. September corn closed at USD3.90 1/2, down 2 1/4 cents; December corn closed at USD4.04 1/2, down 2 1/4 cents. Weekly crop progress report showed corn conditions deteriorated from the previous week by a point to 71% in the good to excellent category. The USDA also confirmed the sale of 232,000 MT of U.S. corn to unknown for 2010/11 delivery. Spillover strength from wheat also lent support. November London wheat closed GBP6.90 higher at GBP149.40/tonne, with November Paris wheat up EUR12.50 at EUR207.75/tonne. The first of the month brought with it another wave of fresh buying. Nobody seems to have told the funds that they should have been banking profits last week, and today's price action appears to confirm that the uptrend is still firmly in place. London wheat closed off the days highs, November reached GBP153/tonne at one point, but considering the strength of the pound today that was still pretty impressive. Open interest in November Paris wheat is now running at almost 123,000 lots, that is a huge amount. Egypt bought Russian what again over the weekend, picking up 180,000 MT from Cargill and Bunge. These prices were well below that of French or US wheat. When prices rise by these sorts of magnitudes in one day everybody sits up and takes notice. We can't really be in "uncharted territory" because we chartered it a few years ago. You can probably recall how badly and painfully that ended. I sense that we are in for another similar "religious experience". The sixty million dollar question is how high will the funds build this particular house of cards before it all falls down again, in my opinion. Follows through from Friday night's close, adding further gains with front month wheat currently 15 1/4c higher, soybeans up 10-12c and corn up around 4c. The weak dollar will continue to help US export hopes, with the pound rising to 1.5750, it's highest since mid-February. I'm out all day today so no more blogging until this evening. Are The Shops Still Open? They are in Russia it seems, drought or no drought. Our old mates Egypt managed to pick up offers of USD238/tonne from Cargill and USD239.50/tonne from Bunge for Russian wheat over the weekend in their latest tender, according to GASC. Those offers were around USD20 under the cheapest French wheat put up by Nidera on a two ports of loading basis. Russia clearly hasn't sold out just yet, and what it has left to sell is still comfortably blowing EU (and US) wheat out of the water. The cheapest US wheat was USD262.25/tonne incidentally, and there's a higher freight cost to add on top of that too. The Cargill offer of USD238/tonne represents a USD27/tonne, or 13%, increase on the cheapest wheat offered in their last tender a fortnight ago. As recently as the end of June they were picking up Russian wheat for only USD165/tonne.